I love homeschooling. Let me say that again, I love homeschooling. That being said, there is always a downside, a ying to a yang, a left to a right. For every Pinterest pretty moment, I can name at least one not so shining moment. I have a child with ADD possibly ADHD. One of the reasons I chose to keep him home is because I knew I could do better for him, and I didn’t want to medicate if I didn’t have to. So yes, sometimes (many times), focus can be an issue with him. But here is the kicker, it is more a problem with his little sister because she is simply a dreamer and a stubborn independent who easily falls off on tangents! Not only do I have one teen in the house, but now I have TWO! Sometimes the attitude feels like it is pushing me out of the house! The eye rolling, the snide tone, the “yeah mom, okay mom” just to put me off! I get so frustrated feeling as though I am always the bad guy, no matter how much I try to do for them. I worry sometimes about their friends. 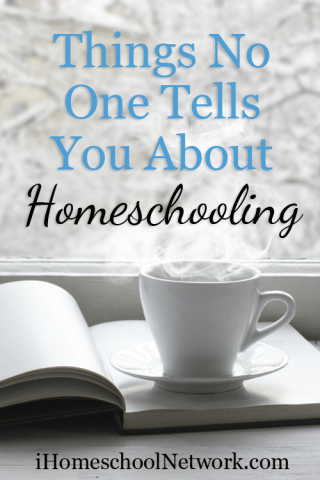 While they each have their own niche of friends I often feel that homeschool mommy guilt of, “Maybe they would be better off in school?” Then I think seriously? With all the hate, bullying, and inappropriate behavior! My son gets a daily dose of it just in the swim team locker room and that is enough! The norm. What is the norm anyways? I know that most people around us don’t see us as they norm. Many of the kids try to convince my to go to school, or tell them what they are missing out on, but will that make them normal? Or better yet, do I want them to be this so called normal? Nevertheless I worry about the decision we made so many years ago and if I have kept them from a chance to be “normal”. Or more apply titled, “The In-completion of Work.” I get so tired of trying to keep them on task. From the littlest to the biggest I am always the task master (and in turn the bad guy) from trying to keep them on task to complete their work. This stems back with my younger ones to the lack of focus and fighting with each other. With both my high school and middle school student we work on teaching time management and working with their own planners. My goal is for independence in high school (which by the way my teen does brilliantly – most of the time.) It is those other times when I find myself pulling out my hair! Sometimes being the sole provider of your children’s education, for their entire life can feel daunting and overwhelming. There are inevitably outside questions about if I am qualified or not, let alone the self doubt over if I am doing their education justice or not. If my children were in school, we would have some space from each other. Instead there are days (heck there are weeks) where we all feel like we can’t get enough distance from each other. Either the kids are antsy from the bickering and toe stepping, or I am feeling like I just need 5 minutes in the house with no noises, no one calling my name or needing to tell me a story or complain about their sibling. Argh! The paperwork! I am a dot my “i’s” cross my “t’s” kind of girl so I am knowingly aware that I possibly create more paperwork for myself than is necessary. I strive to keep good records from daily tracking to high school planning. Some of it is out of my control as well. We live in New York State where the homeschooling regulations require more paperwork than most states. When your kids are in school they most likely get bused to and from. When they get older and play sports they stay after and you only drive once to pick them up. When they have games they are bused with their team. In our home, all our children play competitive sports. Therefore we are driving 3 children both to and from a practice almost everyday of the week, with many days where we could not do it with just one person, we need both of us to run the evening sports schedule. While sometimes our time in the car together can be fabulous with great conversations or singing, other times I just want to be home and not traipsing all over. 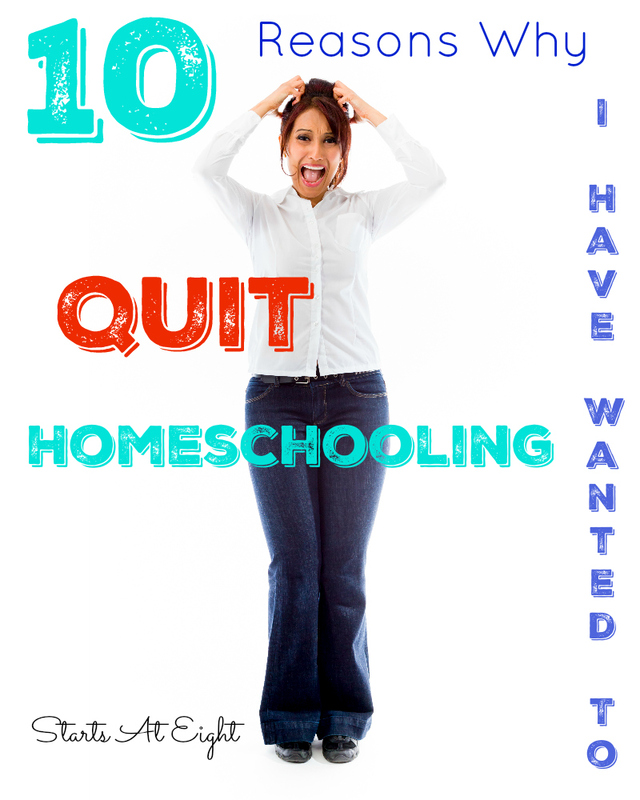 Here’s the thing though, for each and every one of these reasons why I have wanted to quit homeschooling, I can name at least one reason why I love homeschooling. Have you ever wanted to quit? What things drive you to the brink? These are all super true! This is exactly how I feel! Thank you for sharing this!! Yes! Yes! Yes! All of these! Bless you for sharing! Today alone I experienced at least 3 of these…lol. Posts like this help our community keep the faith and know that we are not alone in our triumphs and our struggles. Thank you! Awe, thank you so much for the encouragement! I definitely think it helps to show the struggles with the triumphs. Knowing someone else is going through the trenches too can be a real help when you are struggling. Some days I want to lock them in their rooms so I don’t have to hear them! The sibling fighting and teen tude are definitely two of my biggest pet peeves!